Surprise! 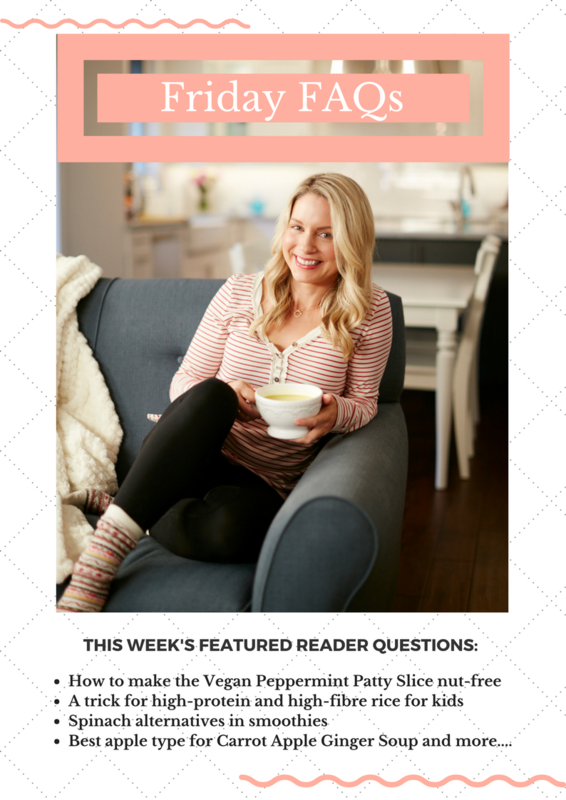 I’m so excited to let you know that Friday FAQs are officially back in action! I hope you’re as pumped as we are to see this series rolling again. I’ve also given the Q&A a bit of a playful makeover to kick off the new year! What do you think? PS: The intro image above is from 2015—note to self: update photos! If it were current, there’d be lukewarm (but very strong) coffee in that mug; two kids fighting in the background; toys scattered everywhere; and food smashed into my shirt. No big deal. Lol. If you’re not familiar with our Friday FAQs series (which admittedly came to a screeching halt when I became a mama of two! ), I’ll share a bit of background: Each Friday on the blog, you’ll find featured questions from our amazing Oh She Glows community (that’s you!) along with my thoughts and replies. These are questions I’m asked on the blog, Instagram, Facebook and Twitter, as well as by email or even in the grocery store—you name it! I reply to oodles of comments and questions each week, and in these roundups I try to highlight those I receive most often and ones that I think will be helpful to others too. As always, if you have a question, please feel free to leave it below and I’ll put my thinking cap on. Who knows—it may even be featured in a future Friday FAQs post. And of course, you can always chime in on the questions with your own two cents, or any specific feedback about the series. My goal is to make these posts as helpful as possible, so I’d love to hear your thoughts! Q1. Hi Angela, I forgot to write down your high-protein and high-fibre rice idea for the kids. Do you mind sharing it again? A. Hi Susan, My kids love rice and I came up with this trick for boosting the protein and fibre: I mix uncooked rice (usually white basmati since it cooks quickly) with uncooked red lentils (again, these cook quickly!) in a pot and cover them with a couple inches of water. Bring to a low boil, reduce the heat, and simmer uncovered for 10 to 15 minutes, until both the rice and lentils are tender. Then I drain off the water in a colander and add the drained rice-lentil mixture back into my pot. Next, I’ll stir in some marinara sauce, hummus, garlic powder, and Herbamare for flavour. You can flavour it any way you like, of course. My kiddos love rice prepped this way, and Adriana can’t detect the added lentils—let’s just say she has a complicated relationship with regular lentils! I love knowing they’re getting a huge protein and fibre boost. You can play around with the rice-to-lentil ratio too…I don’t tend to measure it when I make it. Q2. 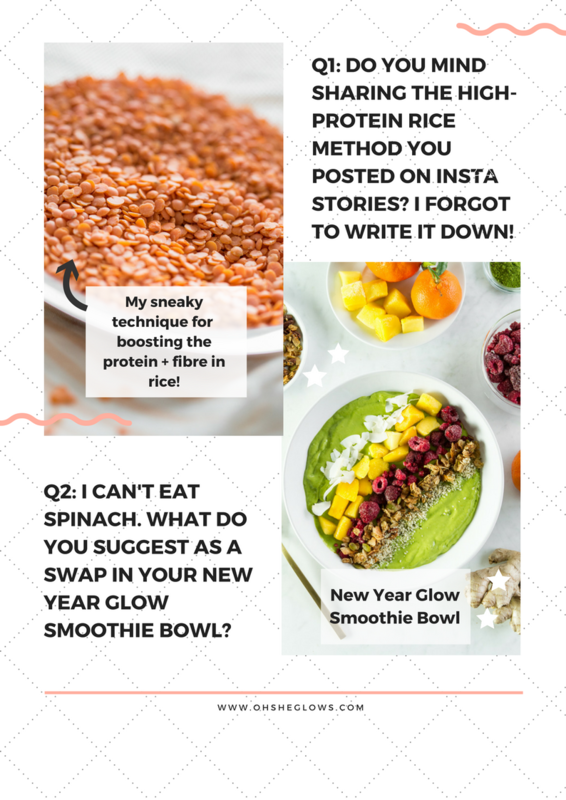 Your New Year Glow Smoothie Bowl looks great! Do you have any suggestions on what to substitute for the spinach? I can’t eat spinach, and I find it’s used so often in smoothie recipes. A. Hey Julia, I’ve had great success using baby kale in this smoothie. 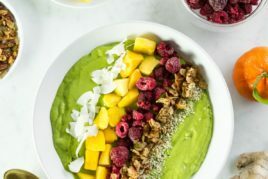 I love baby kale because it has a delicate flavour that isn’t as overpowering in recipes as regular kale, but you could try stemmed full-size kale in the smoothie bowl too. I also wonder how romaine lettuce would taste, but haven’t tried it out yet. Q3. Thanks for this Bread-Free Stuffing Balls recipe! I can’t wait to try it. 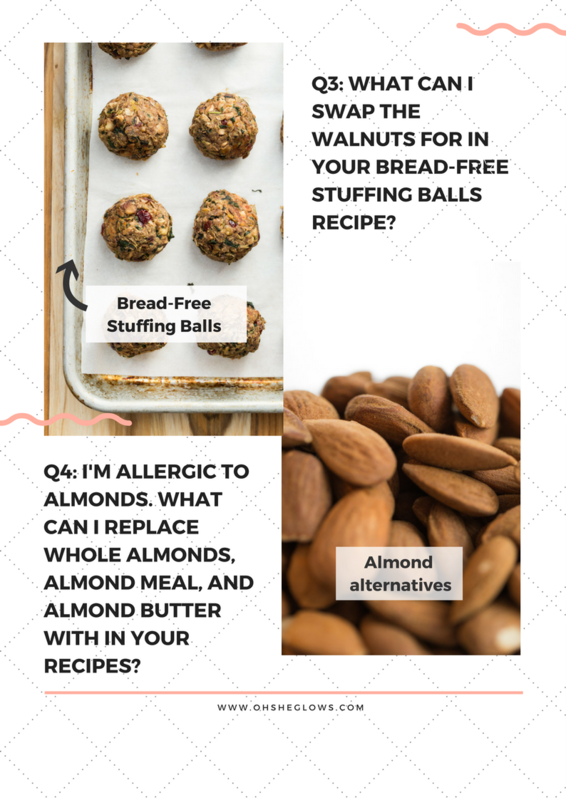 Quick question – my husband has a walnut allergy. Any recommendations for replacing the walnuts? A. Hey Beth, I think chopped pecans or pepita seeds would work fine as a sub for walnuts. I’d probably opt for pecans because I can see the flavours pairing well. I can’t wait to hear what you think! Q4. Hi, I have both of your books and the app. Love your recipes! Do you have any good substitutes for almond, almond meals, and almond butter in the recipes? I’m allergic. A. Hey Justina, Thank you so much for the book and app love! I hope you’re enjoying them. As for subbing almonds out, it can often be done successfully, but I find that advice depends on the recipe. If you have any specific recipes you are thinking of swapping them in, I can try my best to troubleshoot for you below. Swapping the almond butter for roasted sunflower seed butter can work in many recipes, such as my Ultimate Flourless Brownies in Oh She Glows Every Day. Sometimes you can swap almond meal for ground cashews or other nuts and seeds depending on the dish. In the meantime, I’d suggest checking out the nut-free sections in the app and on the blog here and here. If you have any specific recipe questions, I’m always happy to help! Q5. I’m allergic to cashews. Any other nuts I could replace cashews with? 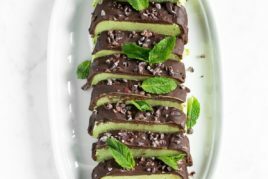 This Vegan Peppermint Patty Slice looks yummy and I want to try it. A. Hi Lise, I’ve successfully swapped the cashew butter for 3/4 cup (115 g) soaked raw sunflower seeds. The flavour changes a bit, but it’s still a good nut-free option! A reader also said almond butter worked nicely. Q6. 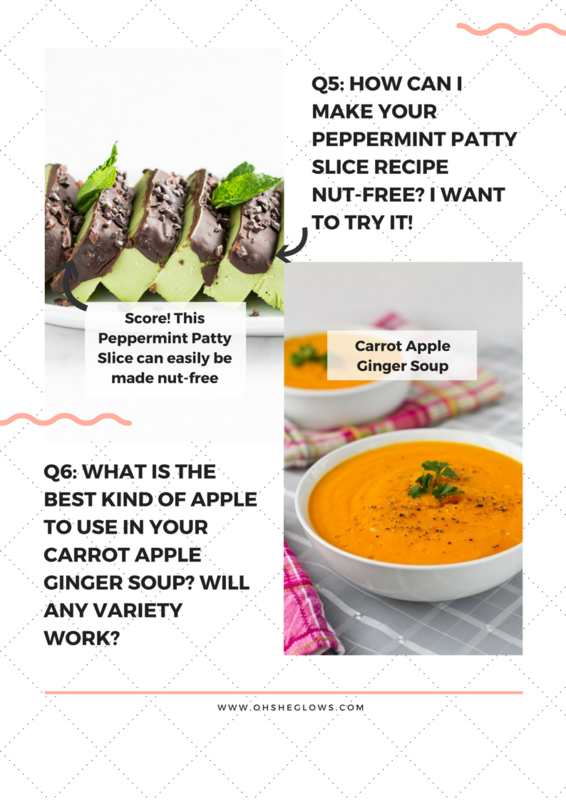 What kind of apple would you suggest for this Carrot Apple Ginger Soup? I never know which flavours work with what. Thanks! A. Hi Nicole, I like Granny Smith apples in this soup because their tart flavour balances the carrot’s sweetness quite well. But I really think it would work fine with just about any variety you like! Hey Linda, This means so much to me to hear, thank you! I’m so happy the recipe was such a hit with you and your husband. Our loaf never lasts more than a couple days. All the best to you both in 2018! Last but not least, I’d like to share some super fun Oh She Glows Recipe App news! It’s currently on sale for 99 CENTS for the next few days in celebration of the new year! Whohoo. 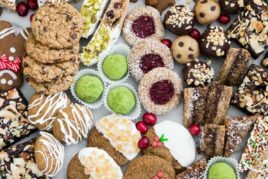 When you download our award-winning app you’ll receive over 130 plant-based recipes (including over 105 gluten-free), plus a FREE cookie lover’s bundle! You can find it on iOS/iTunes and Android/Google Play. I’m so glad Friday FAQs are back! I’ve actually been meaning to submit one of my own: for dates, how do you wash them before using? Sometimes they have a delicate, peeling skin so I get caught up taking this off and next thing you know I’ve peeled my dates…Is a rinse good enough? Yeah…Friday FAQS are back! Thank you soooo much Angela! I can’t wait to try your high fiber rice and lentils…it is next on the list. I usually make homemade marinara sauce and hummus,, but do you have a favorite jarred marinara and ready made hummus brands? It would be helpful to be a quick one pot weeknight meal! I am excited and look forward to more posts and vidoes! Happy & Healthy 2018! Hey Kristen, So glad you’re pumped for the return of Friday FAQs. :) As for store-bought marinara and hummus, you bet I do! My fave marinara is the “White Linen Collection” marinara found at many Costco locations (but not all, sadly). We’re all obsessed (including my extended family too). For store-bought hummus my go-to’s are Fontaine Sante organic hummus and Sunflower Kitchen classic hummus (both Canadian brands, I think). I use them in Adriana/Arlo’s fave 10-minute pasta recipe (on the blog and in the app)…it’s so fast. Hope 2018 is off to a great start! Hi Jenny, Oh man…I can’t even tell you how many vegan vanilla and carrot cakes I’ve attempted over the years! I’m so picky and don’t like to share anything I’m not 100% sold on which is why I haven’t posted any of my trials yet. So many of the vegan vanilla cakes I’ve tried have a gummy texture…I can’t stand for that, lol. But I will keep your request in mind so I don’t give up. Hey Kathy, Thank you so much for the cookbook and app love!! And for gifting them too. :) I’m so honoured!! A few grain-free flours that I use are: almond flour, coconut flour, and cassava flour. You might be able to experiment with a combo of those flours in recipes calling for oat flour, but generally it takes some patience to get the right ratios (and it would vary depending on the recipe). I’ve tried using straight up cassava flour as a 1:1 sub for regular flour in several recipes and I was not pleased with the texture/flavour yet (I’m thinking a combo of grain-free flours may work better). Is there an oat flour based recipe you’d like to try first? Hey Angela! I just wanted to let you know what a great resource your recipes have been to us. Our little guy just turned 1 (man does it go fast!) and he is a huge fan of your 10-minute pasta recipe. I usually make it with lentil pasta for him so it’s packed with protein and fiber. Thanks for the lentil and rice tip as well! I will absolutely be trying it. Red lentils are also great in your Heartbeet Cabbage Soup to bump the protein and fiber, they don’t impact the taste at all. It’s his favorite soup, although hugely messy! Oh and a note to Jenny, no help for the vanilla cake, but I have made the “Whole Grain Carrot Cake Loaf” into cupcakes or even a cake tin and topped with cream cheese icing (the one you use on your cinnamon rolls is great). It is perhaps the tiniest bit denser than a “classic” carrot cake because of the spelt, but absolutely delicious nonetheless. Thanks Jessica! It’s awesome to be getting into a groove again for sure. All of my best wishes to you and your beautiful family! Aww thank you Kat!! That means the world to me. I hope 2018 is off to a great start for you! I got your second cookbook for Christmas and love the cheese sauce. Would it be possible to replace the normal potatoes with sweet potatoes (or 50/50). My boyfriend has a mild allergy to regular potatoes so he can only eat small amounts of them. Hi Ariane, I haven’t tried a sweet potato version yet, but I think some blog readers have tried it out and said they enjoyed it. The cheese sauce will be a lot sweeter though due to how sweet they are. Please let us know if you try it out! Those peppermint slices look AMAZING!!!! Need to try that one for myself soon! Thanks :) I hope you love it as much as we do! Wondering whether you’ve ever made a green monster with sprouts, and if so how it turned out? I try to eat local but there’s not much green in the winter, and I wonder whether the greenhouse grown stuff is any less resource intensive than stuff that’s flown here. Also I think it would be fun for my daughter to see where her food comes from. Also – I expect you know this, but I reckon it’s worth repeating positive things :) Your recipes hold a very special place in our home. After my daughter was born the first thing my husband defrosted for me was your Thai sweet potato, carrot and almond soup. It was warm, hearty, and healthy and exactly hit the spot, and I am reminded of that day every time I eat that soup. My daughter is a HUGE fan of your sweet potato casserole so it was the basis of her first Christmas dinner and will be part of her birthday dinner too :) She’s allergic to dairy so your no-fail chocolate cupcakes will also be on the menu – I have been looking forward to making these for her for months! So that’s another couple of recipes that will hold a special place in my heart. Aww Eleanor, your comment made my day!! I’m so touched by the stories behind the recipes you’ve enjoyed. :) So sweet! As for smoothies, I use a sprouted broccoli and kale powder in my smoothies lately (it’s by Sprout Living), for an extra boost. I haven’t tried using actual sprouts before, but now I’m curious to try it! Such a great idea.